study, alfalfa leaves were exposed to heated air at temperatures up to MOOT for given periods of time in order to determine the rate of drying under various conditions of time and temperature. This information will be useful in designing a compact, efficient unit for drying alfalfa leaves. Ultimately, this unit may be made mobile. 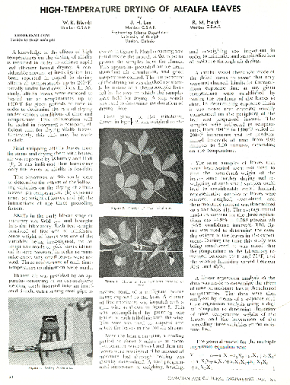 Held stripping alfalfa leaves from the stems and drying them with heated air was reported by Whitney and Hall (4). It was indicated that harvesting only the leaves of alfalfa is feasible.